Studer’s annual Motion Meeting at its Steffisburg, Thun, Switzerland headquarters came just ahead of the biennial GrindTec show held in Augsberg, Germany, in March, and the company was holding off on the details of three new Studer cylindrical grinders to be revealed there, except to indicate that these would replace existing models and not add to them (see April issue for more details). GrindTec product releases that were heralded at the 2 February event, however, were three software products of the Industry 4.0, Smart Factory type. These were: Production Manager, Remote Service and Service Monitor. With Studer’s machines already sporting the increasingly popular data interface OPC UA (see https://is.gd/gayuyo) and offering 36 defined signals, the company’s machines generate information, but this needs to be visualised and analysed in software, and that is where the first product, Production Monitor, comes in (initially for UGG machines, but with future releases likely having a wider use, Machinery was told). Remote Service allows, with customer permission, access to a company’s UGG machines for the purposes of remote diagnosis of equipment problems (the security element of this was heavily promoted). Service Monitor makes it easier to consult operating instructions related to maintenance tasks. This software tool displays, in a simple diagram, the maintenance due date of all connected machines. Armed with this knowledge, a structured maintenance plan can be created. An amusing demonstration of the accessibility of these tools was given in a ‘sketch’ that involved a technician in the room with the audience, an office cleaner in the adjacent factory, a production manager at a football match and a production machine also in the factory. First, via Skype, we are transported to the production manager’s office where he is nowhere to be seen, but the cleaner is. She is asked to have a look at the machine to see if it is running; it is. We then move to the production manager, again via Skype but this time on a mobile phone, and he confirms, in between drinking, eating and cheering, that the machine is, by reference to Production Manager, running. To test the other parts of the system, the cleaner is asked to press the red button on the machine; it stops. An alarm interrupts the production manager’s game, but he is able to arrange for Remote Service to be brought into play. Reality or not, it neatly underlined the capability available (and customer service was a theme at the event, see box, below). There will be a staged release of these three software products, with them available first in Europe, following GrindTec, then in North America later this year, followed by China, around the middle of next year, and then all other regions later next year. It should be stressed that the service offering will be available only in territories where Studer is the service agent, which is not the case in countries such as Japan, Taiwan, South Korea and, in Europe, The Netherlands, for example. UGG has a wide ‘smart’ vision that will support its customers and which takes in sales, machines, its factories and service. The vision for its own Smart Factory was expressed graphically at the event, but not detailed explicitly. 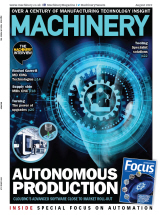 The graphic variously showed machines fitted with sensors generating information taken to the cloud; digitally connected manufacturing steps; self-learning systems; predictive maintenance; procurement automation/connected suppliers; smart assemblies that direct operators to the machine to which they should be fitted; operators helped by cobots; 3D-printed part manufacture; and plug-and-play commissioning. The benefit sought is a 20% gain in both capacity and throughput time in 2020. 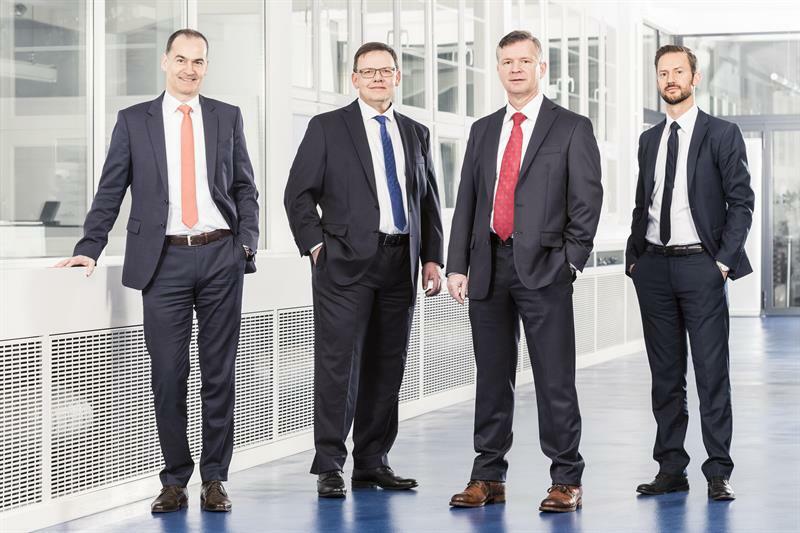 But, as Jens Bleher, Studer CEO, explained, the Industry 4.0 capabilities adopted by customers will be those that provide them with real benefit and not just technology for technology’s sake, so to speak. Apart from the service offering unveiling, an internal digital development highlighted under the “Studer goes digital” headline was detailed, digital work instructions. A UGG initiative, via tablet computers these provide step-by-step assembly instructions and tracking and tracing of the assembly process. The system’s popularity was underlined by various positive worker quotes. The system will be introduced by the Studer-Mikrosa-Schaudt cylindrical group on a wide basis this year. Supporting greater efficiency and precision in machining is investment in 5-axis machining technology. The cylindrical grinding machining HQ at Steffisburg has expanded its core competence in mechanical processing with the commissioning of a large 5-axis milling centre; two more 5-axis centres with integrated turning function are planned for this year. This is one of the biggest investments in this area, Stephan Stoll, Studer COO, underlined, adding that this “offers the ideal prerequisite for digitising the manufacturing according to the 4.0 standards”. Additional investments in measuring machines support the claim to highest precision, Stoll advised. At a detailed machine level, a sensor development that was highlighted was related to a superior method of detecting wheel/part and wheel/dresser contact, with capability in the micron range; the technology is called Studer Sensitron 4.0 and is already part of the S11’s armoury. Previous technology of the acoustic kind was negatively affected by in-process noise, from coolant or centres, for example. And on the matter of coolant, the company gave more information about the development of additively-made coolant nozzles for cylindrical grinding and the benefits to be had from them. Working with IRPD AG, active in 3D printing, coolant nozzles having laminar flow characteristics are being developed. Offered in single units or banks, these nozzles can be tailored to application. That means for straight profile wheels that are employed in straight- or angle-approach tasks, or for contoured wheels where the nozzle can accurately deliver coolant in a related ‘shaped’ manner. For companies that want some flexibility in contour grinding, systems with plugs can allow a single nozzle set-up to have its delivery shape altered. This method of delivery significantly improves both part quality and process times. Once again at its annual event, Studer was able to demonstrate continual improvement across multiple fronts, because, as Stoll puts it: “Being good is the worst enemy of becoming better.” Clearly becoming better is forefront. New chief service officer Sandro Bottazzo was keen to highlight the company’s credentials in this area. The company’s customer care department has 200 employees worldwide and is expanding. First off, he said that some 50% of customers have service contracts, adding that its system maintenance offering is used by more than 1,500 customers a year. Second, he underscored Studer’s rebuild/re-engineering offer, which is supported by a department of 20 that overhauls 500 assemblies and 30 machines every year. But he also added that finding and keeping good field service technicians (FSTs) is a challenge. On the first, a structured training programme that takes individuals through six skill levels is implemented, while retaining them is afforded by offering them a career path away from FST, once the requirements for travel demand more than an individual is any more willing to give, thus retaining the skill within Studer. The new S11 – the smallest production cylindrical grinding machine in the Studer range (125 mm centre height; 200 mm between centres) – now benefits from Studer standard grinding cycles and the StuderGRIND offline programming software, the latter made up of a variety of modules: StuderDress for an optimised clearing strategy, for profiling grinding wheels; StuderThread for thread grinding: StuderForm for form grinding: StuderContour for grinding longitudinal contours; and StuderGeoImport for convenient use of workpiece geometry straight from a DXF file. The conversion to the new control in the S11 provides even more advantages, Studer adds. Up to now, grinding wheel speeds of 50 m/s (in exceptional cases 80 m/s) were possible, but now HSG machining is possible with CBN grinding wheels and at grinding speeds of up to 140 m/s. The S11 now also enables typical C-axis applications, such as thread and form grinding, supported by StuderThread or StuderForm. Furthermore, profiling/reprofiling of grinding wheels with StuderDress and the machining of longitudinal contours with StuderContour extend the scope of application of the S11. Other machine features include the SBS Dynamic Balance System, a unit for contact detection via vibration measurement and for the semi- and fully-automatic balancing of grinding wheels. This reduces machine downtime, thanks to less air grinding, and also enables the process to be monitored via the grinding noise level. And automation is made easier with guarding having a top hatch for vertical loading, it is pointed out by the company. The second EMO world première was the Maegerle MFP51, a 5-axis grinding machine that, it is claimed, sets new standards, in terms of flexibility and equipment features (https://is.gd/ikiwiv). The machine is an advance on the 500, 650, 650 mm (X, Y, Z) work envelope MFP50. In its basic version, the new model has an integrated toolchanger with 66 positions and can be loaded with various grinding wheels, diamond rolls, measuring probes and tools for drilling and milling operations. Very short process times are achieved via its 12,000 rpm spindle and the overhead dresser integrated into the grinding support (grinding wheels and diamond dressing rolls are simultaneously exchanged for the individual machining steps). A bi-axially-controlled nozzle provides optimal coolant supply for grinding, drilling and milling, and there’s an optionally available nozzle changer. An identification system for grinding wheels and tools is optionally available, as well.